Region: This bug is found throughout southern United States. Life cycle: This insect produces three to four generations each year, except in the South where it may breed year-round. The adults hibernate in garden debris. They lay their eggs in early spring on the undersides of early blooming plants. Physical Description: This 1/4 inch long insect is flat, shiny, black with brilliant orange to red markings, and shaped like a shield. The distinctive eggs are easy to identify. They look like small white pegs or barrels with black hoops, standing on ends in double rows on the underside of leaves. The oval nymphs are red and black. 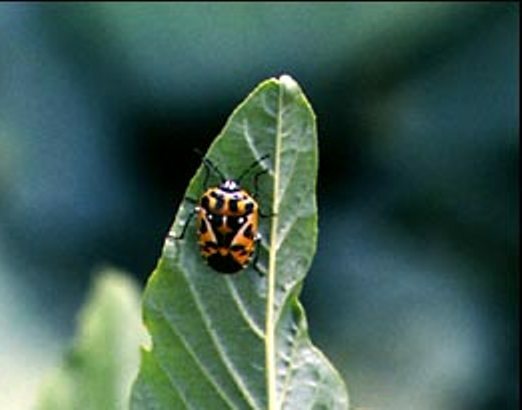 Feeding characteristics: This pest will attack Brussels sprouts, cabbage, cauliflower, cherry, citrus, collard, horseradish, kohlrabi, mustard, radish, and turnip, draining the juices out of the plants, causing them to wilt, turn brown and die. White and yellow blotches are also a common appearance. In the south, infestations often destroy whole crops. Controls: If your crop is small, remove the Bugs and drop them into a bucket of water. Insecticidal soap sprays give effective control. Use pyrethrum or sabadilla.